Kiev has a good selection of tourist attractions, enough to occupy most visitors for a week or more. Conveniently, most are in the city centre or just a short Metro ride away. The city is known for its magnificent churches and cathedrals. Top of the list and Kiev’s most popular tourist attraction is Pechersk Lavra (the Caves Monastery). This UNESCO World Heritage Site is a huge complex of churches and museums, and if you see nothing else, you must visit this. Other notable places of worship include St Michael’s Golden-Domed Monastery, St Sophia’s Cathedral, St Volodymyr’s Cathedral, and St Andrew’s Church. Kiev is a very green city with many beautiful parks and gardens to choose from. Many run along the western bank of the Dnipro River. You can start in the city centre at Khreschatyk Park and walk right to National Botanical Gardens around 5 miles away, passing Mariyinsky Park and the Park of Glory on the way. Museums and historic buildings and sites are also a big draw. The Golden Gates date back to the 11th century and were once part of the Kiev’s city walls. The Motherland Monument, Soviet Ukraine’s answer to the Statue of Liberty, towers high above the Museum of the Great Patriotic War. 10 years after Ukraine gained its independence a similarly sized monument was erected at Independence Square. For a pleasant day in the country visit the open air museum at Pirogovo. 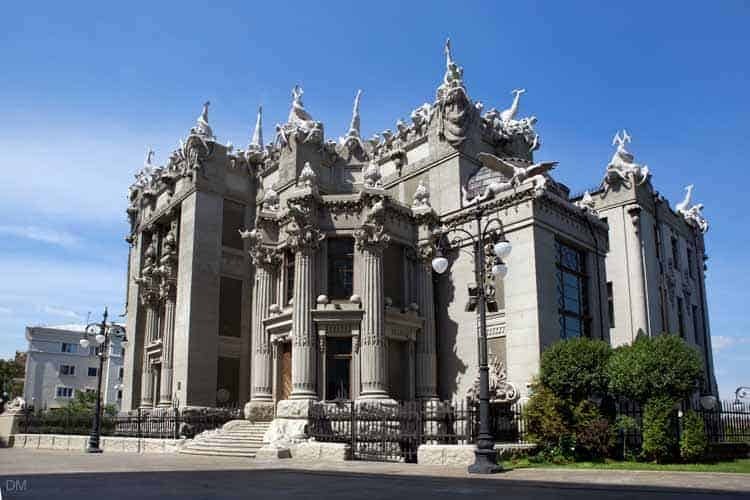 Located on the outskirts of Kiev, this is one attraction that can’t be reached on foot or by Metro. To relax in the city take a stroll along Khreschatyk or browse the colourful stalls at Bessarabsky Market. Haunting insights into darker aspects of Ukraine’s history can be found at Babi Yar and the Chernobyl Museum. The city’s most artistic street. Home to the Green Theatre and the Church of St Nicholas. Site of the largest single massacre of the Jewish Holocaust. Park in Kiev city centre with attractions such as Lovers Bridge and the Dynamo Stadium. Tenpin bowling centre in Obolon. Ancient fortification built by Yaroslav the Wise. Large botanical garden in the Pechersk area of Kiev. The focal point of Ukraine’s Orange Revolution. Kiev’s most famous and well-trodden street. Attractive park at the end of Kiev's main street. Giant statue celebrating the Soviet Union's victory over the Nazi Germany. National theatre offering a wide repertoire. The biggest stadium in Ukraine. Hosts football matches of the Ukrainian national team and Dynamo Kiev, plus concerts, and other events. Major music, exhibition, and sports venue. Frequently used as a venue for celebrations and exhibitions. Contemporary art gallery in the city centre founded by Ukrainian billionaire Victor Pinchuk. Park offering some of the best views in the city. Monastery with sky blue cathedral and magnificent bell tower. One of Kiev’s most impressive landmarks. Neo-Byzantine cathedral with striking yellow exterior. Grim museum telling the story of the world’s worst nuclear accident.